Estuaries are dynamic systems constantly adjusting to change. Future changes in the climate, however, have the potential to alter estuarine systems beyond their current variability. The waves most readily observed at the coast are those generated by the wind. Wind waves observed at a particular location are either sea or swell. Understanding the broader regional geomorphological context is useful for coastal management planning and decision-making in many places. Oceans absorb a substantial proportion of the CO2 emitted into the atmosphere by human activities, with potential negative effects on shell-forming organisms. Groundwater is hard to see, expensive to measure, difficult to understand and challenging to simulate. This document provides an introduction to groundwater and a discussion of the possible range of groundwater related climate change impacts. A good rule of thumb provides a quick method to evaluate hazards such as beach erosion but, where a risk is identified, should be followed by more rigorous methods of analysis. 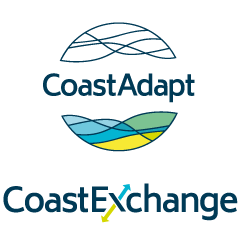 CoastAdapt provides three risk assessment templates that allow users to systematically follow the guidelines for assessing climate change risks, and record relevant information gathered at each step of a risk assessment. Models can be used to evaluate the risk of inundation and erosion along the coast, both now and in the future. However, many models are resource intensive, and external expertise may be required. This guide provides a quick overview to determine whether a mapping product is fit for purpose, understand the limitations of available mapping products, and determine when a more detailed assessment and mapping approach might be required.